And you thought you had to buy a TV? Not on Super Bowl Sunday! This entry was posted in Capitalism, Grand Rapids, Happiness, Positive Thinking, Promotions, Super Bowl XLIX, Uncategorized and tagged And That's The Truth! !, Common Sense Consulting, Tom Urich, TuneUp Promotions on January 31, 2015 by tomurich. This entry was posted in Uncategorized on January 29, 2015 by tomurich. Think clearly about this article. It shows that there is coercion between the forces of BIG information and the control of it by this administration. We should start calling this “The Bergdahl Swap-Gate!” I am a Patriot and I want Justice from the top down. This message is approved and paid for by me, Tom Urich. No public money was used and no electrons have been sacrificed. This entry was posted in Grand Rapids, Happiness, Justin Amash for Congress, Liberal Media, Libertarians, Politically Correct, Positive Thinking, Uncategorized and tagged And That's The Truth! !, Bergdahl Swap-gate, Common Sense Consulting, Grand Rapids Michigan, Tom Urich, TuneUp Promotions on January 27, 2015 by tomurich. I had to re-blog this. Just because………………..
As if we didn’t have enough to worry about with North Korea, ISIS and the very real threat of another Justin Bieber album, now we can add “drunken cats” to our terrorist watch list. That’s right. Because it’s not like cats didn’t already have enough attitude, right? 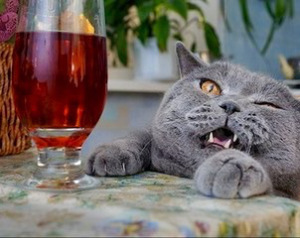 Thanks to Japanese manufacturer B&H Lifes, cats can now get drunk and REALLY disagreeable while drinking a new wine developed specifically for the feline palette. Apparently cat inhibition is a big problem in Japan. This entry was posted in Uncategorized on January 26, 2015 by tomurich. The essential error of the Obama presidency is an unfounded belief that greater government power—in our pocketbooks, in our private lives—will make America more prosperous and free. President Obama’s faith in concentrated power was on full display in tonight’s State of the Union address. Working families feel squeezed by higher health care costs and tuition bills. Those fortunate enough to hold steady jobs haven’t seen a raise in years. They worry about their children’s future and their country’s. The president seems to have only one answer for them: enlarge the size and scope of the federal government. To help middle-class Americans, the president demands more than $300 billion of tax hikes and a new round of stimulus spending. To rein in education costs, the president creates a federal education entitlement, the type of which led to skyrocketing tuition in the first place. To fix our health care system, the president touts the same law that has caused prices to rise and stripped families of access to their doctors. To make the financial system more stable, the president threatens to veto reforms to Dodd-Frank, his law that made banks bigger than ever. And to protect Americans’ privacy, he offers yet another report instead of reining in his own spies. This entry was posted in Brian Calley, Capitalism, Grand Rapids, Happiness, Justin Amash for Congress, Libertarians, Politically Correct, Positive Thinking, Uncategorized and tagged @UrichTom, And That's The Truth! !, Common Sense Consulting, Michigan, Tom Urich, TuneUp Promotions on January 21, 2015 by tomurich. This is TOO GOOD to pass up. Sorry this is only a Re-Blog – but MSNBC is starting to show its colors big time. It is a tool for Liberals. This entry was posted in Capitalism, Hostility, Liberal Media, Libertarians, Promotions, Reverse Racism, Uncategorized and tagged And That's The Truth! !, Common Sense Consulting, Grand Rapids Michigan, Tom Urich, TuneUp Promotions on January 11, 2015 by tomurich. Signup Confirmation – Think with Google. This entry was posted in Capitalism, Grand Rapids, Happiness, Politically Correct, Positive Thinking, Promotions, Think with Google, Uncategorized and tagged Common Sense Consulting, Grand Rapids Michigan, Michigan, Tom Urich, TuneUp Promotions on January 5, 2015 by tomurich.